Just outside of Paris at Seine-et-Marnes, Depayz'arts celebrates the end of the year with a small programme of oddly sited work. On the opening night there's a late (11am-3pm) collection of outdoor work at the wide, flat local velodrome – mostly large-scale spectacle and street arts, but with cross-media juggler Adrien Mondot and acrobatic troupe Le Cirque Mandingue in among it. 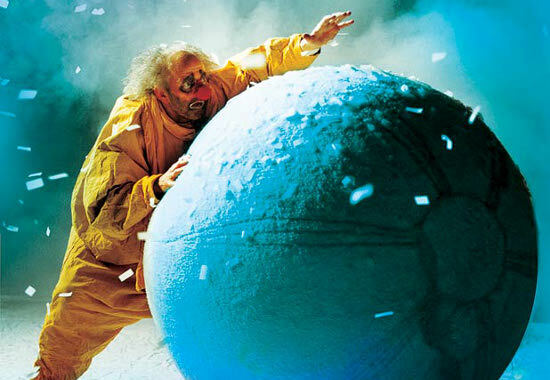 Slava Polunin's Snowshow – his undying Snowshow – gets another four performances at Depayz'arts to add to its tally of hundreds, but here there's a difference. Since 2002 Slava has been based in the Seine-et-Marnes area – specifically in the Moulin Jaune, a mill on the banks of the Grand Morin – and for the duration of the festival there's a guided tour, Slava's Snowhome, that leads people into the Moulin's gardens and through an installation collecting some of the work of Slava and artists who've visited his HQ. Then at a local contemporary art gallery, Galleria Continua, juggler Philippe Menard and illusionist Johan Lorbeer are running a performative tour of the site. Lorbeer will levitate, as is his wont; Philippe will present a piece, Por favor, tirar meus oped back chao!, using plastic bags and artificial air currents and responding to a piece of work housed in the gallery, Pascale Martin Tayou's Plastic Bag.